I also have a radio-controlled trigger than I bought off eBay. Only €40 got me a transmitter that sits on the camera hot shoe plus two receivers. This way I can trigger two flashes from anywhere in the room. This system comes with little flash mounts, each having a hot shoe on top and a tripod screw beneath. 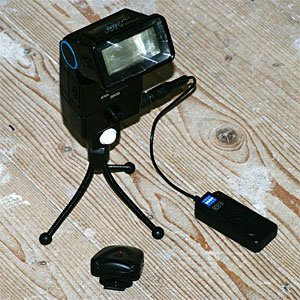 So you screw the tripod into the mount, slide the flash on top of the shoe, turn on the flash, turn on the receiver, dial in to the correct channel (out of 16 choices) and you are ready! If you are interested in manual flash techniques an overwhelming wealth of information can be found at the Strobist blog and Flickr group. Those people do professional work with gear that costs a fraction of the pro studio setups. For my first of three setups I wanted to turn the strawberry against itself and go for an evil look. 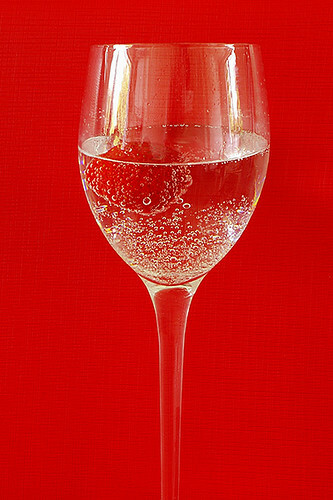 I put half a strawberry in a wine glass half full of water, just because I thought the reflections and refractions might look nice. 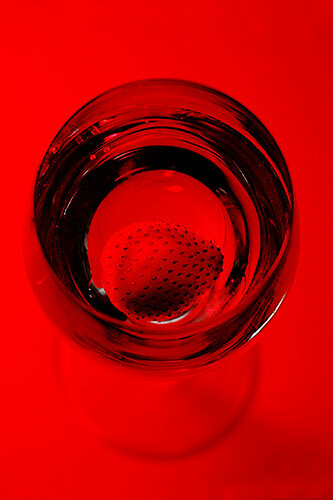 I used the flash as fill, bounced off a red surface perpendicular to the one the glass was resting on. In fact this was just the seat and back of a handy chair, some new folding ones we've purchased for the garden. I took the shot with the amazing FA 77mm Limited lens, using a 1/180 second exposure at f/4.5 and ISO 200. The result is a strongly tinted image. Some creative digital work brought out the contrast. The dark glass is appropriately sensual, and I love the hazy base of the wine glass ghosting in the bottom of the image. In fact I am very happy with the results. The one thing I might do is burn the highlights to make it even more of a dark tone image. Since in the first sequence the strawberry was kind of hiding in the shadows, I designed the second shot to show off the different textures and aspects of the fruit, up close and personal. By the way one fringe benefit of this shoot, unlike professional food modeling, is that I was able to eat the berries afterwards... no glycerin or other yucky stuff used here. For this image I used an old manual focus lens, the Vivitar Series 1 105mm f/2.5 macro. This is thought by some to be the best true macro ever made; certainly it is very good. This photo was a 1/125 second exposure at f/4 and ISO 200. This was chosen for control over the depth of field. I think it was about 1:2 magnification, enough fit several different pieces into the frame. My critique of this shot: it mostly works but needs to be sharper and composed a little better. The highlight area in the top left is too distracting. Also, if I was to try this again I'd stop down to f/8, just to get a bit more 3D definition. Still, it's rather nice and shows off the strawberries at their juiciest. 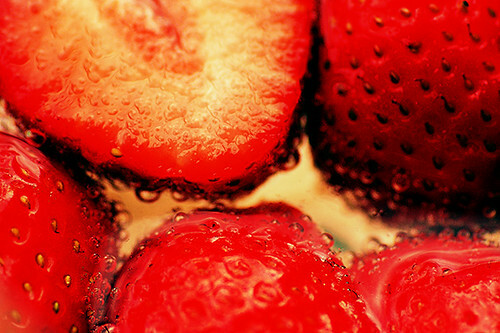 The third strawberry aspect is maybe the most obvious, a stab at the "cool summer fruit" feeling. A wine glass and some sparkling water was the ticket. In fact I had to run out and buy sparkling water, which really cut into my 60 minutes! If I had a studio I could control the reflections but here I had to take them as they came. Other than that I am happy with the shot. The glass, bubbles, fruit and backdrop all have their own distinct textures, and each integrates well into one fresh feeling -- that's what I was after. For this I used the FA 43mm Limited since the FA 77mm would have meant stepping back too far to get in the glass. For some reason the best shot was a 1 second exposure at f/16 and ISO 200. Since there are moving bubbles I would have thought a faster shutter speed would have been crisper. Well, there you go. I hope you enjoyed this little exercise and that it's made you hungry not only for some nice ripe summer berries, but for a spot of still life photography too!